﻿﻿﻿﻿﻿Just for fun, I've decided to enter author Susanna Leonard Hill's Halloweensie writing contest. In case you haven't checked out Susanna's blog yet, I recommend it! It's a great place to hang out if you write picture books (or if you write any kind of children's books). She has really useful features like Would You Read It on Wednesdays, where writers can get reactions and critiques of their short pitches and Perfect Picture Book Fridays, where you can learn about great picture books. And she even has yummy treats! Post your story on your blog between now and Thursday October 31st by 11:59 PM EDT and add your post-specific link to the list on Susanna's blog. Harrison flicked his pointy ears. Oh no. Leona’s wand broke after the wart-away spell. What? Now he was a boring, black cow. “Mooo!” said Harrison, wishing he still had claws. Sparks flew. Harrison’s fur crackled. He bared his teeth. Perfect. He could have a monstrous cat nap. In this whimsical, original folktale written and illustrated throughout in vibrant full color by two celebrated masters of modern fantasy, a young girl's journey becomes an enchanting coming-of-age story about magic, friendship, and the courage to shape one's own destiny. Lillian Kindred spends her days exploring the Tanglewood Forest, a magical, rolling wilderness that she imagines to be full of fairies. The trouble is, Lillian has never seen a wisp of magic in her hills--until the day the cats of the forest save her life by transforming her into a kitten. Now Lillian must set out on a perilous adventure that will lead her through untamed lands of fabled creatures--from Old Mother Possum to the fearsome Bear People--to find a way to make things right. 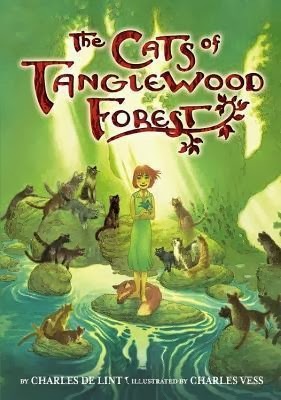 It was interesting to read about Lillian’s adventures and the forest from her two perspectives as a girl and as a cat. I also liked the unexpectedness of where the story was going. It meandered like a walk in the forest, where you never quite know what you’re going to find. I haven’t read many middle grade novels with full colour illustrations. Charles Vess , who collaborated with Charles de Lint in developing the ideas behind the story, created lovely pen and ink drawings to complement the action and enhance the magical, fairytale feeling. Charles de Lint lives in Canada, near Ottawa. Along with being an author, he is a painter, poet and musician. He writes for adults as well as children and teens. His books have won many awards, including the World Fantasy Award, the Canadian SF/Fantasy Aurora Award and the White Pine Award. For more info, visit Charles de Lint’s website. You can find more Marvelous Middle Grade Monday books by checking out Shannon Messenger's blog! Shannon is the founder of Marvelous Middle Grade Monday and the author of the middle grade novels, Keeper of the Lost Cities and Exile (Keeper of the Lost Cities #2). "If you do not value libraries then you do not value information or culture or wisdom. You are silencing the voices of the past and you are damaging the future." "It is easy to pretend that nobody can change anything, that we are in a world in which society is huge and the individual is less than nothing; an atom in a wall, a grain of rice in a rice field. But the truth is, individuals change their world over and over, individuals make the future, and they do it by imagining that things can be different." "We have an obligation to understand and to acknowledge that as writers for children we are doing important work, because if we mess it up and write dull books that turn children away from reading and from books, we've lessened our own future and diminished theirs." 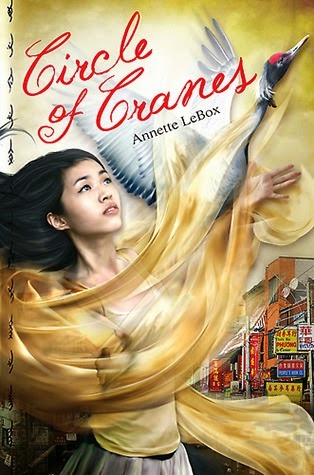 Thirteen-year-old Suyin is a poor orphan who has a strange gift with languages and a mysterious connection to the cranes in her small Chinese village. When a shady human trafficker arrives promising luxury and riches beyond belief in America, the villagers elect Suyin - whom they consider lucky - to go as their benefactress. But instead of luxury, Suyin is forced to work in a sweatshop in New York City's Chinatown. Suyin's future seems hopeless, until her beloved cranes arrive and reveal that she is no ordinary girl - instead, she is the daughter of the Crane Queen. Now her mother's life is in danger, and Suyin must prove herself worthy of her position as the Crane Princess, in order to save her mother and the entire clan of cranes. For fans of Grace Lin and Laurence Yep, this is a beautiful story of the meaning of family and finding one's true path in life. This story is an interesting combination of fantasy, legend and gritty realism. I got very absorbed by the hardships and difficulties Suyin had to endure when she traveled to Gold Mountain to earn money for her family. The book had the feel of a historical novel and at first I thought it was, but notes in the back explain that it’s based on events that took place in more recent time (1999-2000). That definitely gave me a lot to think about. I love legends and was intrigued by the legend of the cranes. As a writer, I especially enjoyed the images of nature that were woven throughout the story. “The crane took small graceful steps like a miniature ballerina wearing a feather tutu." Annette LeBox lives in British Columbia, where she spends some of her time in a remote cabin. For more info, visit Annette LeBox’s website. You can find more Marvelous Middle Grade Monday books by checking out Shannon Messenger's blog! Shannon is the founder of Marvelous Middle Grade Monday and the author of the middle grade novel, Keeper of the Lost Cities. I'm excited because the nominees are out for the Ontario Library Association's Forest of Reading! Every year kids across Canada read the nominated books and vote for their favourites in the spring. I usually try to read all of the Silver Birch category nominees, and many of the Red Maple ones. But this year I'm going to try to add the Blue Spruce group too. The Blue Spruce nominees (K - grade 2) include Jon Klassen's This Is Not My Hat, which I've already read, so I have a head start. I haven't read any of the Silver Birch fiction nominees (grades 3 - 6) yet. I'm looking forward to getting started! I didn't realize it until this year, but there are also the Evergreen nominees for adults. They sound interesting too, but I don't know if I'll get to this category! A supportive family. My husband and children are so understanding when the house is a disaster and my office is full of piles of junk that never seems to get cleaned up. They've had to put up with frozen pizza dinners, being late for school, waiting for me...the list goes on. Insightful critique partners. The writers in my critique group, the MiG Writers, give me honest feedback on my work and are always there to help me reason through a stumbling block or to help me celebrate the tiny successes. And my picture book critique partners, Pam and Laura, are so good at pinpointing problems and finding all the confusing places in my stories. I'm so glad I connected with all of them! Time and space. I've been able to arrange my time and living space so that I have a quiet place to work, and I'm very thankful I've been able to do that. I'm definitely an introvert who needs quiet time to think, process and "recharge". Determination and persistence. I will keep working on something to get it right and hate to give up (thanks to Mom and Dad, for passing these qualities along). Even though sometimes my persistence is misplaced and I have to remind myself that the bigger picture is more important than the details. Optimism. I do get discouraged sometimes, when I get another rejection, or when I get stuck on something in my story and can't seem to move forward. But after a day or two of feeling down, I usually bounce back with renewed enthusiasm. I'm really thankful to be able to look around and ahead, and appreciate what I have and the people around me. What are you thankful for as a writer? Happy Thanksgiving, if you're celebrating!! 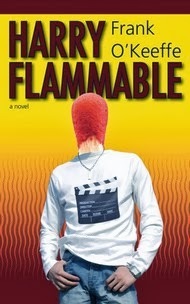 Despite a disastrous attempt at driving a bike through a burning refrigerator box in second grade, high schooler Harry Flanagan never gives up his goal of becoming a movie star or at least a stuntman. However, since the bicycle episode, it seems as if fires pop up everywhere Harry goes, earning him the infamous nickname of "Harry Flammable." Now a shed at Harry's school has been set on fire, destroying Work Experience Counsellor Shamberg's new mountain bike -- and Harry's charred cap was found at the scene. Harry's dream Work Experience placement with Pocket Money Pictures is given to another student, and Harry is forced to take a position with Chef Antonio at the restaurant in The Ritz, the hotel Pocket Money Pictures' staff is staying at while filming a historical adventure flick set in China. Will Harry find a new way into the movie of his dreams, or will he be forced to endure a placement he hates and an inevitable kitchen fire ... or two? Although this book is listed as YA, I think upper middle grade readers would enjoy it (ages 11-14). The book is not packed with action, but the pace moves along and I was interested to find out how Harry was going to get out of some of the situations he got himself into. There is a bit of romance with his feelings for Celia, a girl in the work experience program. The idea that Harry seemed to get himself into trouble with fires everywhere he went was a lot of fun! As a writer, I really enjoyed the different settings the author included in this novel, including a hotel restaurant, the hotel itself when Harry was on room service duty, and a movie set. It made me think about how different settings have an important role in bringing a story to life. Frank O’Keeffe is a Canadian author living in Calgary, Alberta. He has worked as a farmer and a fourth grade teacher, in addition to being a writer. If It Rains Again Tomorrow, Can We Go Home? For more info, visit Harry O’Keeffe’s facebook page or read about Harry Flammable on the Dundurn Press website. You can find more Marvelous Middle Grade Monday books by checking out Shannon Messenger’s blog! Shannon is the founder of Marvelous Middle Grade Monday and the author of the middle grade novel, Keeper of the Lost Cities. I read a lot about writing strong story openings, and also about writing awesome endings, but for me, the hardest part of the novel is the middle. You know, that tricky part where the characters try to solve their problems and reach their goals but aren't really getting anywhere--except into a giant tangled mess of plot threads. One of the problems I find with the murky middle is that the storyline can go in different directions, depending on the choices I make as the writer. Sometimes, I get stuck thinking about how I can't go on if I don't get the pieces right in the middle. Or the right order for the scenes. Or...you get the idea. There's always something. So, the best solution is to just dive in and try something. But what? What I usually do first when I get to feeling lost with my writing is to stop and think about my characters and what they really want. How can I help them get there? Then I look back at my outline and think about whether what I planned to write will actually get them to where they need to go. Maybe there's something wrong with the outline. Or maybe I've gone off in a different direction and something needs to be changed, either in what I've written or in the outline. 1. Gary Korisko suggests, "Accept that stuck is sometimes part of the creative process." [This Is What Blocks Your Writing (And How to Bust Through), Write to Done, September 30, 2013]. An interesting point in Gary's post is how having too many ideas can get you stuck in your story. Like in the middle, where there are lots of different possibilities for where the storyline can go and you feel stressed about choosing the "right" one. Sometimes the solution is to just wait it out, take a break, and let the ideas sort themselves out in your mind. Some stories take longer to write (or revise) than others. 2. If you know the ending, write backwards! Over at The Blood Red Pencil, Elspeth Antonelli reminded me that there's more than one way to get through the middle [Your Manuscript's Menacing Middle, October 2, 2013]. Why not start at the end and work back? It seems like a great solution to try, especially if the middle is really messing with your mind. Focusing on the ending could help make it easier to see which choices in the middle are most helpful in guiding the character through to the next big plot event. Do you have any other tips to help with the "messy middle" problem?